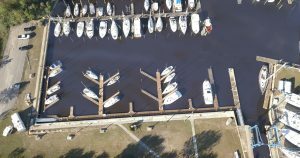 Just three miles south of downtown Wilmington on the Cape Fear River in North Carolina lies Wilmington Marine Center and Wilmington Marine Service, a 130 wet slip marina and marine service center. Its basin is ideally located for local and visiting boaters and also serves as a great storm refuge in an area that has seen many named storms. 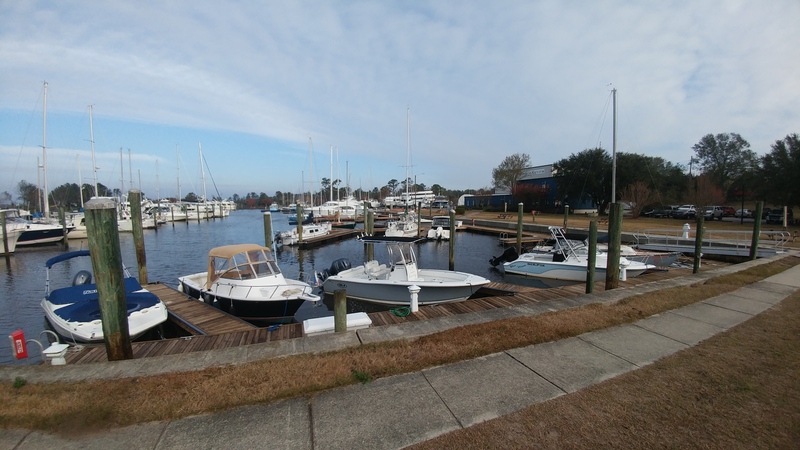 With its easy access to the Cape Fear River and capable service facilities, the marina and service center underwent some changes and renovations in order to grow an already successful business. The property the marine and service center resides on is a 45-acre tract of land that was originally a junkyard used by utility contractors. Identified as an ideal location it was then bought by a group of investors in 1987 and over time built into the marina and service center that it is today. Wilmington Marine Center re-imagined their service division and replaced dated docks with an innovative new design. In December of 2016, the partners of Wilmington Marine Center decided to make some changes in order to gain greater control over the service side of the operation. Rather than continuing to lease the service operations to several outside companies, as it had done for 20 years, it formed Wilmington Marine Services, LLC. With the already existing infrastructure, such as a 400-ton marine railroad and a 75-ton lift, and new equipment, Wilmington Marine Center wanted to grow into a full-service facility. For the past four years this has been happening under the watchful eye of Hank Hinckley, the second-generation boat builder of the same well-known name. He happened upon the marina while taking a boat from the Hinckley yard in Savannah to Maine and suffered engine troubles. While his boat was being worked on, he ended up renting an area of the yard to work on other boats. With an obvious affinity for the marina and seeing the potential it had, he ended up volunteering to oversee the growth and development of the service division. The marina reconfigured slip space for large boats to fit more slips for boats in the 22- to 35-foot range. Hinckley thought he would be able to get things going within a couple of years but quickly discovered that skilled labor was in short supply and he had to readjust his expectations. He then decided to get a small group of experienced craftsmen together (himself included) and mentor a new generation of apprentice workers in service work and restoration, with the goal of them eventually taking over as craftsmen at the facility. He was quick to point out that growth at the service facility was at a pace commensurate with the labor capable of doing the work at a high level. As a result progress proceeded along with the pace of the training. Realizing the potential in having a paint booth at the facility, Hinckley and Mike Loch, the marina’s dockmaster, went to work researching the best plan of action to make this happen. Despite experience with spray booths in the past the strict regulations and standards in the area prompted them to look for guidance. They consulted with Sam Bowling of SK Bowling in Wilson, North Carolina, an experienced spray booth builder in the region. “He came over and it became obvious he knew what he was talking about, and we set up a plan to build this booth,” Hinckley said. The yard owned an adjacent two-bay truck garage that had been used to support the trucks working in the port. After considering the profile of jobs the yard brought in, it was determined that fixing up one bay of that building and modifying it to become the yard’s spray booth was the most economical and best way to proceed, rather than building a new structure from scratch. Bowling worked on the engineering and permitting requirements and provided engineering drawings and acceptance documentation, and the local government authorities did not have trouble accepting the design. Even though the dimensions of the structure were a bit unusual (as it was half of the large building divided down the center with a large supporting wall) and the long bay posed a challenge, Bowling was familiar with much of the equipment used from previous projects. Equipment such as the exhaust stack added to the top of the building and the lighting systems “that is all stock and trade of his business,” Hinckley said. All of the design had been used and approved in other facilities built by Bowling. “The decision to go with someone was key as opposed to doing it all ourselves and that turned out to be a good decision,” Hinckley said. Heating, electrical, insulation and fire controls were all overseen in house by Loch and Hinckley. The metal walled structure was insulated and sheet rock hung prior to the construction of the booth. 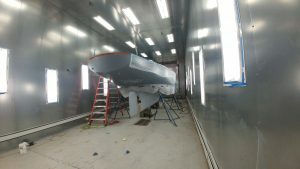 Wilmington Marine Center and Wilmington Marine Service on the Cape Fear River in North Carolina underwent renovations to grow its service business, including a new spray paint booth. The end result of all this work is a booth that measures inside approximately 70 feet by 17 feet and has a 14 ½ foot overhead door. With exhaust fans that can blow a painter off his ladder if he is not holding on, the result is no fog at all. Lighting and filtration is top notch, and Hinckley said that a third-generation painter employed at the center claims he has never worked in a booth that nice. The booth was designed with filtration that allows craftsman to work on two smaller at the same time or one larger boat in the 40-50 foot range. More than the dimensions of the building, the facility is limited to what size boat can be brought via a Brownell trailer overland across the property to the booth. Future plans include a road to the structure that will allow bigger boat access. The build has been a success, and painting projects have begun at the facility. At the time of writing, a Hinckley Bermuda 40 was just brought to the booth for painting. The only real issues Wilmington Marine Center encountered with the build was the time involved in permitting and the cost of getting water to the building for fire suppression. They ended up going with chemical suppression as it was more cost effective. It also allows for easier cleanup should a false alarm occur as chemical suppression would cause less damage than water. Based on how business goes with this booth, the future may justify a second, larger booth being built that could handle boats up to 100 feet, but time and demand will determine when that happens, according to Hinckley. Another recent improvement to the marina side of the operation was the installation of 30 new floating Bellingham Marine slips designed at a 45-degree angle to maximize slip space for the marina’s growing client base of boats in the 22- to 35-foot range. Previously, 12 older dock slips were designed for larger craft from the Hattaras dealer onsite with limited slip space. Wilmington Marine Center already had plenty of other slip spaces for boats more than 70 feet, so these slips were limiting potential business for smaller boats. Leaving the design to Bellingham to maximize slip space, the dock builder came up with an innovative design and built and delivered the docks from its North Carolina facilities. The 45-degree design, as opposed to the traditional 90-degree design, allows for more slip space and easy docking. The marina is running at more than 80 percent occupancy and is looking to be at maximum occupancy soon. Permitting for 30-amp power to each slip has taken longer than expected, but at press time that project is in its final stages of completion. Loch is thrilled. “It is a fantastic design and they executed it well,” he said. Having survived Hurricane Florence unscathed Loch said the marina is now planning another 20 to 30 slips and is working with Bellingham to design those too. The marina sees even more growth in its future. In addition to increased service infrastructure, Wilmington Marine Center wants to increase basin size and add drystack to the facility.